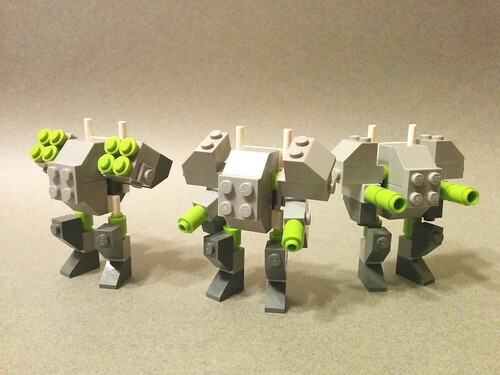 Mobile Frame Hangar • View topic - PaM-30 "Laborer", PaM-32 "Heavy Laborer"
PaM-30 "Laborer", PaM-32 "Heavy Laborer"
A frame build challenge ala Mantiking's Single Set Challenge using only the current PaM parts that you can buy in any quantity in PaB cups. With the parts limitation, I started with a variation on my C6 Chub arms and made a box to connect them to. I tried for a head, but nothing worked. While trying for a head I ended up with this body and it looked like a wide Commissar/Conscript so I went for some skinny legs. I used my C6 Chub 'hands' just so it would have some kind of basic hands, but I think the gun arms look much better. It has a very similar size and footprint to a Chub. It has very limited articulation, but just enough implied articulation that you get the idea. It's a pretty solid game piece too. I really tried for a HtH system, but I got nothing. The back-mounted jumpjet is stupid-simple but functional. The SSRs and the little sensors are ok, but if I were to use these as-is I'd take a little Brasso to the Mixel eyes and remove the printing for plain white round tiles. You could play with these as-is or throw on a few other bits like tileclips for hands and a splash of color for company designation and these could be rather respectable. Playing with systems on the Heavy's, I found a missile pod that I liked (the missile pod has an open stud on the bottom so it could easily be fitted to the top handles too although it might be a little back heavy then). 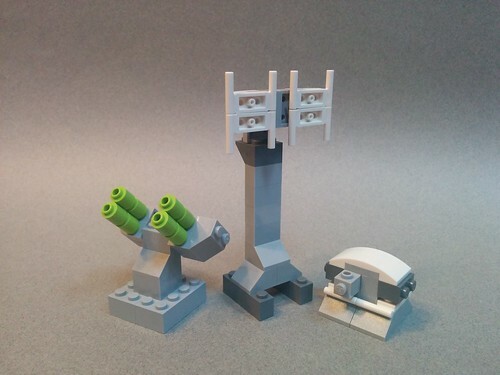 With the missile pod, I think I solved my HtH problem: the guns can be , the cannons , and the missile pods . Yeah, all three ranges! After frames I set to recreating my three go-to stations: AA Gun, Comm's Tower, and Genny. They're functional. I didn't try to make any flags, but I'm sure you could make something like my C6+ flags if you had too. Otherwise a few extra parts for flags and a color splash to match the frames and your good to go. The parts selection even allows for some easy, basic terrain/cover albeit in all grey. I'm guessing you could get 5-6 frames and 2-3 stations from a single small cup ($9US) if you stacked well; you could start playing a small 3 player game for under $20US. If you've been tempted to start playing but didn't know where to start or if you have a friend who needs a starting point for a company, this is hard to beat. If you live near a Lego store, I don't know if there's ever been an easier way to start playing MFZ. Re: PaM-30 "Laborer", PaM-32 "Heavy Laborer"
Those have a really pleasing aesthetic to them. Almost like a "walking Ipod" thing going on. The body an arms are top notch already, if I were to complement them with other parts I would just have a tile clip hand as you've said already. The legs are very charming in their simplicity. While they have only one point of articulation the round brick thigh makes them look natural on any position. 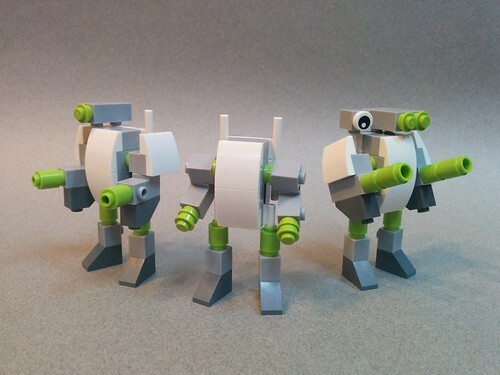 I just recommended this post to a friend of mine looking to build his first squad. I need to practice making frames as (apparently) simple as these - I keep trying for all the articulation. I think one of my favorite parts about this set of builds as a starter kit is that you're left with a collection of bricks that will easily support whatever you plan to build as you expand your collection. They may be a little boring in color now, but those gray bricks will find their way into future frame designs of many colors until they wear out. I love this single Cup challenge idea. I will have to try it my next visit. Those stations are great as well. A prime example of what can be done with a limited selection of bricks ! one of my favorite parts about this set of builds as a starter kit is that you're left with a collection of bricks that will easily support whatever you plan to build as you expand your collection. MK, let me know how these work out for your friend. Be sure to have them take a good parts list so they can make all the frames they want and to look around at the other stuff on the PaB wall; there' are some other good pcs there right now and if your store happens to have a misc bin like mine there are green and black headlights, 1x2 plack plates, 1x1 rnd black plates, 1x1 black cones, black 1x1 cheese, white 1x2 cheese, 1x2 double sides snot bricks, yellow 'new headlights'... TONS of good bits for systems, flags and mod'ing. darksyntax wrote: MK, let me know how these work out for your friend. He went in a different direction. 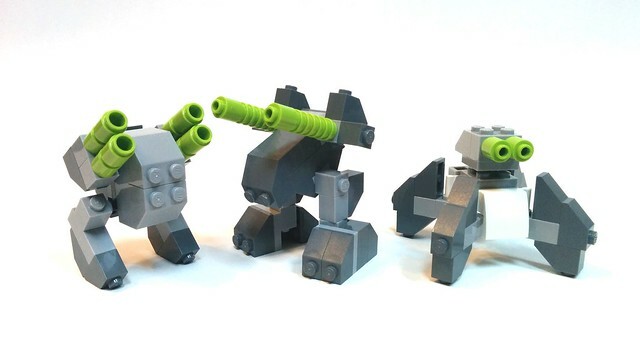 I'm really tempted to make a variant squad based on your core plus parts from several Mixel Gurggle sets. darksyntax wrote: Be sure to have them take a good parts list so they can make all the frames they want and to look around at the other stuff on the PaB wall; there' are some other good pcs there right now and if your store happens to have a misc bin like mine there are green and black headlights, 1x2 plack plates, 1x1 rnd black plates, 1x1 black cones, black 1x1 cheese, white 1x2 cheese, 1x2 double sides snot bricks, yellow 'new headlights'... TONS of good bits for systems, flags and mod'ing. My local doesn't do a miscellaneous bin unfortunately. I'm not sure how they get rid of their leftovers. Mantisking wrote: My local doesn't do a miscellaneous bin unfortunately. I'm not sure how they get rid of their leftovers. I really like the Heavy Laborer. The new sketches are brilliant! How is the core of the quad made? Hackjob wrote: I really like the Heavy Laborer. The new sketches are brilliant! How is the core of the quad made? Is it a pair of 1x2 bar plates mounted vertically? That's really clever. Nicely done on all three. Even the back sides look finished. I would like to add that I'll be forever recommending the the "round bricks into 1x2 plate with bars as a hip" to my friends that have only a small collection of bricks after a very fruitful experience last weekend. Blorf wrote: Is it a pair of 1x2 bar plates mounted vertically? That's really clever. Nicely done on all three. Even the back sides look finished. Now that I look closer, I think Blorf is correct, the bar plates fit into the headlights. That is clever! Hackjob wrote: How is the core of the quad made? 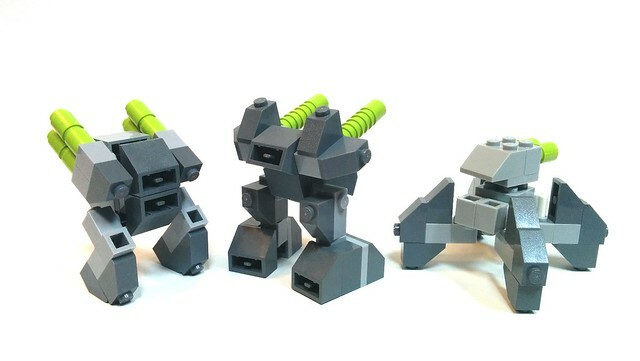 Really like the chunkier ones , reminds me of Dragon and Sunder battlemechs! Since I'm new, I'm missing some of the lingo; what kit did you start with ? Teppudama wrote: ...what kit did you start with ? 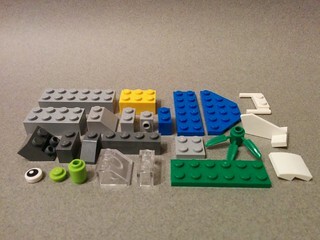 Not a set, but Pick A Model parts purchased in Pick A Brick cups. Brick&mortar Lego Stores have bulk bins of parts where you can fill cups of whatever you want. 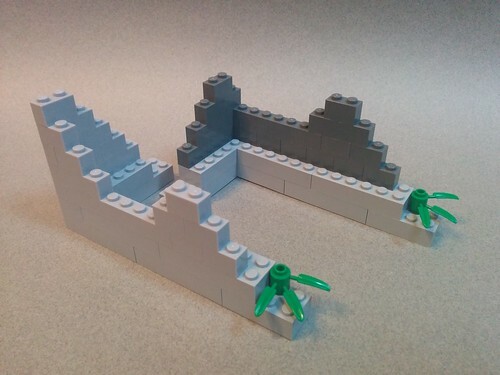 In April2015 Lego added Pick A Models to the wall of bins (models change quarterly). The idea is that you can pull the parts for the little models for $5USea, but better for us is that you can fill whole cups with those parts too (there were some early fears that the parts wouldn't be eligible for filling cups, but that was largely unfounded). 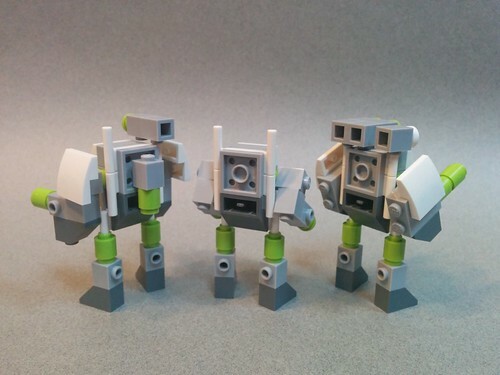 Generally there are some good MFZ parts in the mix. This brickfan post describes the whole thing pretty well and this Hangar topic has a lot of info on the subject as it pertains to MFZ usefulness. Will have to look and see where the nearest Lego Store is; I could swear my wife said there was one here but not positive. Teppudama wrote: Will have to look and see where the nearest Lego Store is; I could swear my wife said there was one here but not positive. There are three stores in Washington; Alderwood in Lynnwood, The Bellevue Collection in Bellevue, and Westfield Southcenter in Seattle.